In the whiteout of our 3D-Printing “TMI” blizzard, all of us are looking for the hand-raised letterpress signals against the featureless noise of petabyte-gray backgrounds. So, if you’re in the business of galvanizing 3DP awareness, exciting attention, educating ignorance and focusing the white-hot beam of change through the fog of the future, how would YOU illuminate the way forward for our Additive Manufacturing industry? 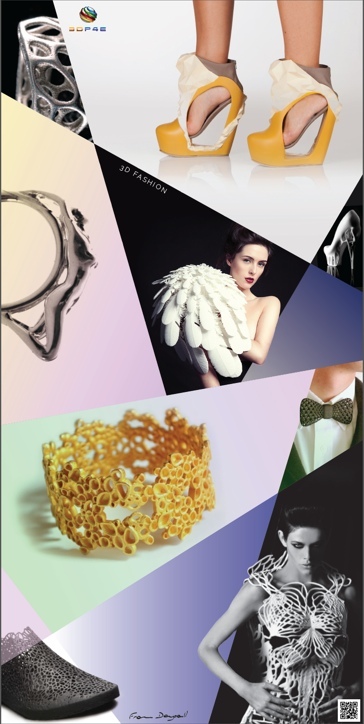 3DP4E’s “3DP’d Fashion” Poster: first in a series of traditionally printed, four-color, frame-able posters celebrating the new worlds of 3D Printing as “collectable” art. Well, you might lead by emulating 3DP4E.com (“3D Printing For Everyone”) of New York City. (The folks who just brought you “3D Printing and Digital Fabrication Resource eBook” [on which I’ve reported here on 3DPI] and also presents a Beginner’s Guide online…among other curated, categorized and creative Web-based paths to 3DP knowledge). You’d print up a poster—yep, four-color inks on heavy, clay-coated paper. A wall-mounted statement: tangible, tactile, tackable…and rare. Decidedly—and delightfully—NOT digital. That is by deploying the counterintuitive, showcasing the retro and shining the brass of steampunk sensibility for your geek/glam techreative-audience members. (I consider this last to be another synonym for Brooklynites in 3DP…) And, that other—often dumbfounded—multitude that diligently resists the doom of playing eternal catch-up with the accelerating leading edge. These are the folks who need 3DP knowledge most: the clients and customers and deep community a-building via 3DP4E interest and leadership. 3DP4E’s Logo Suite–3D Printing Around The World? Ron Rose, CEO of 3DP4E. Perhaps as an antidote to accusations of quixotic Luddite leanings, poster-maker 3DP4E has positioned the poster itself as a front end to the startup’s larger mission as “a dynamic [3DP] information hub.” A QR Code printed on the poster enables viewers to link to “a dedicated page on 3DP4E’s website with pictures, descriptions, videos and articles on the designs.” Plus, anyone intrigued by the company’s choice of 3DP-empowered designers can learn more about their work on 3DP4E’S 3DP Fashion poster by going to: www.3dp4e.com/posters/3d-fashion. 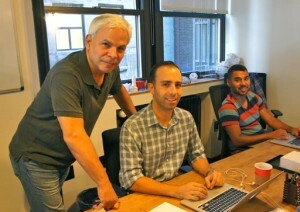 Some of the 3DP4E Team in action at their Manhattan offices: (from left) Ron Rose, Larry Adames & Matt Manuele. Want to get your own look at 3DP4E’s “3DP’d Fashion” poster? Or, claim one for free? Attend World Maker Faire New York 2014 on September 20th and 21st and visit 3DP4E’s booth. The startup will be giving away posters to the first 100 people dropping by on the Faire’s Saturday and Sunday. Going to miss the Faire? 3DP4E’s first poster is also available as a free download on its site and can be accessed directly at: www.3dp4e.com/posters.